Novel, does it tell you something you did not see before? Why/how, does it provide an explanation of how something works, not just a description of what it does? Capable of being actioned, in particular in ways that create impact. Generalisable; is it specific to the case under investigation, or can it be applied elsewhere? 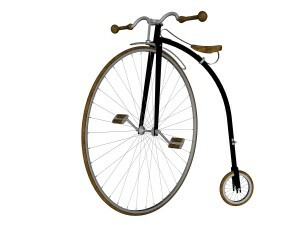 However, it may make it clearer if I share an example of something I think is an insight, all about Victorian bicycles. Why did a penny-farthing bicycle have such a big wheel? Penny-farthing bicycles (or high wheelers), like the one in the image, were very fashionable in countries such as UK and USA from the mid-1870s, for just under 20 years. These bicycles were hard to mount, tricky to ride, and resulted in many injuries (the term ‘header’ was used for people who fell forward off the bike). With all of these limitations, why did this this type of bicycle become so popular, why did it disappear so quickly, and what can this teach us today? Disclaimer: you can jump to the insight, i.e. the next heading, if you want to. This post is set out to follow, and thereby illustrate, the flow from data to insight. In most cases insight is based on data, but once the insight has been found, not everybody needs or wants the data. Bicycles in the 1870s had a simple relationship between the pedals and the wheels. When the pedals went round once, the drive wheel went round once. If the pedals are on the front wheel, then each time you turn the pedals once the front wheel turns once. The link, of one turn of the pedals to one turn of the wheel, means that the distance a bike moves forward is determined by the circumference of the wheel. 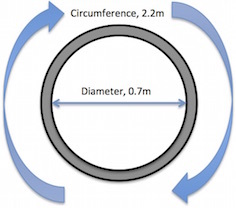 If the circumference of the wheel is 2.2 metres (just over 7 feet), then if the rider turns the pedals 10 times, the bike will move forward 22 metres (about 24 yards). For most people, the fastest they can turn the pedals for any reasonable amount of time is 100 times per minute, for many people the limit is much lower. A typical size for a bicycle wheel is 0.7 metres (0.8 yards) from one side to the other, i.e. its diameter. The circumference of a circle is given by π x diameter. If the diameter of a wheel is 0.7 metres, then the circumference is 3.142 x 0.7 = 2.2 metres. The circumference of the wheel is also the distance it will travel along the road if it makes one full rotation. If somebody wants to travel faster there are two key variables. They can pedal faster or they can have a bigger wheel. Even for sporty people, about 100 turns a minute is the limit to how fast they can turn the pedals. 1 turn of the pedals moves the bicycle 3.142 x 1.5 metres forward, i.e. 4.7 metres. Turning the pedals 100 times in a minute will move the bike 471 metres. Maintaining a spin speed of 100 rpm (revolutions per minute) for one hour will move the bike 28 KM (i.e. just under 18 mph). The change in size of the front wheel, from 0.7 metres to 1.5 metres, increased the top speed from 13 kph to 28 kph. Bike manufactures, such as Eugene Meyer of France, had the insight that making the front wheel bigger would increase the top speed. Later James Starley, UK, added a mounting step to facilitate using a bicycle with such a large front wheel. This led to an arms race in the size of wheels (or perhaps a ‘leg race’, since the limitation is the distance from the seat to the pedals). Wheels grew larger and speeds grew. In 1876 Frank Dodds of UK set a record of 25.4 km for a one hour ride. In 1891 Frederick Osmond also of the UK set the highest record to date of 38 km for a one hour ride. Osmond would have needed to pedal at 133 rpm, quite a feat, assuming his front wheel was 1.5 metres. Today, professional time trial riders have a cadence of about 110 to 120 rpm. Now we have the insight into why the penny-farthing had such a big wheel, we can understand why its popularity ended very quickly. In the 1880s people started experimenting with a link-chain connecting the pedals to the drive wheel. This meant that the tyranny of one turn of the pedal to one turn of the wheel was ended. For example, the cogs on the bike could be set so that one turn of the pedals turned the wheel twice, or three times. Eventually, gears were added, which is simply a method of giving the rider a set of choices about the ratio of pedal turns to wheel turns. In 1885 the Rover Safety Bicycle was launched, and the term safety referred to a large extent to having a normal sized front wheel. Within eight years the production of high wheelers had ended and bikes were utilising chains with links and cogs. The implications for insight today? The first insight is that we should not be too quick to ascribe something as simply a fashion. Penny-farthings were certainly a fashion, but their shape was driven by desire for speed, and an innovation that delivered it. The second insight is the importance of correctly defining the attributes that are driving purchase. The penny-farthing was a very high bike, this improved the ability to see the surrounding world, but the attribute height was largely irrelevant. The motivation was speed, and this was delivered by the large wheel – the height was simply a consequence, not a reason. Third, a product can succeed if it meets an unmet need, in the way the large wheel met the need for more speed. Too often our attention is drawn to case studies where the best product did not win (as in VHS triumphing over Betamax), but generally the product that meets the needs best is the winner. Finally, an innovative product can quickly be replaced if something else meets the need in a better way. The link chain and cog was a better solution to the need for speed, and it quickly replaced the penny-farthing. Music provides a great example of this replacement process. Cassette tapes freed people from the tyranny of needing a record player, but tapes were quickly succeeded by CDs, and then MP3 players, and now sound is mostly accessed from the cloud – all meeting the desire to have my music with me when I am on the move. Penny-farthing bicycles did have one other important benefit. The large wheel was better suited to cobbled roads than a smaller wheel, because it spanned across the lumps and hollows. The introduction of inflated tyres on bicycle tyres in 1888 removed the final edge the high-wheeler had, contributing to the rapid demise of the big front wheel. This YouTube Video of a modern penny-farthing race from Australia manages to convey the speed and the danger of the high wheeler. Week? that will be a very slow trip, and difficult to balance at that rate of turn! It would be interesting to hear your thoughts on why the rear wheel was left at SUCH a vastly smaller ratio — I could understand staying small enough to step over, but I would think being a bit bigger would have some advantage in balancing, etc. Thaks for the spot on the typo, it now says wheel 🙂 I would guess that the small back wheel helped when mounting the bike, if you look at videos of people get on the bike, they tend to do it from the back. I think you missed the point entirely as you didn’t say a word about the reason for the large front wheel and the need for mechanical advantage possible with safety bicycles with their chain and two different sized sprockets on the pedals and the axle of the bike. Without a chain drive, the only way to get speed was to increase the circumference of the front wheel.That arrangement might have improved the ride a little on cobbled streets, but that’s not the reason for the huge front wheel.